While my third attempt at macadamia nut cream pie chills in the refrigerator, I thought I’d share a few pictures of other things I’ve recently cooked. 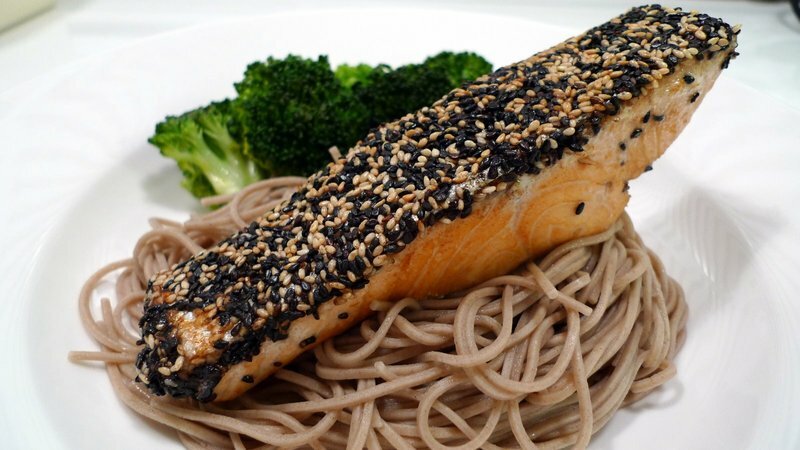 In Hong Kong, my host Dr. Chris prepared a sesame seed encrusted salmon served on top of cold soba noodles for his dinner party. The next day I asked if he would send the recipe to me and he hasn’t yet got around to it. However, since I was his sous chef, I was able to recreate the dish pretty closely. The secret is that the skin side of the salmon is given an egg white and soy sauce wash so the seeds adhere and form a nice crisp crust. You can see the original here. I also did some baking. Leftover white bread, which Tawn had bought while I was in Hong Kong and subsequently forgotten in the refrigerator, was reconstituted as a bread and raisin pudding. Could have used some more egg, but was still quite tasty. A loaf of half-rye bread is in the back, along with a few dozen oatmeal raisin cookies. I brought those along for a dinner with friends at Soul Food Mahanakorn (since they haven’t much on their dessert menu) and then gave the remainder of them to the restaurant staff. Good way to make friends! Have a nice Saturday. I’ll let you know how the pie turns out. This entry was posted in Uncategorized and tagged baking, Bread, Cookies, cooking, food, Pudding, Salmon, Sesame, Soba by christao408. Bookmark the permalink. yes, i’m curious about the pie! i still have yet to make it, but my parents sent me some mac nuts to try it out. That salmon looks amazing! I’ve never had a bread pudding before, but I know that it’s different than pudding that I can buy in the plastic cups and stick in my lunch-bag. So here’s a question I’ve had for a long time: what makes a dish a pudding if the two types I mentioned are different from each other? I love fresh oatmeal raisin cookies. I see…the secret is egg white + soy sauce for the salmon, that will work like glue for the little seeds! Wow! Looks as good as the other and I’m a fan of broccoli over greens… Hope the restaurant staff smiles on you next time you visit! @puella_sapiens216 – “Pudding” is a very broad term that doesn’t have one standard definition. In the US we tend to think of it as a dairy based dessert, often made with eggs or egg yolks – think a custard. So both your Jell-O pudding and a bread pudding (which is bread soaked in a custard mixture then baked) qualify. But puddings can also be other types of baked desserts (think the British “Figgy Pudding”) and even savory like Yorkshire Pudding. @murisopsis – Before they had their land line installed, they set up a mobile phone number which they still use. A selected group of early customers still use it and have the privilege of having their names saved in the address book so I don’t have to say my name. Nifty, huh? It does look good and I’ll need to keep this in mind for a quick (well, relatively quick) weeknight dinner. I’d probably add a couple of drops of sesame seed oil and green onions or chives to the noodles. …i could totally gorge on that raisin bread pudding. nice work man! I would have never guessed that was salmon, but upon looking at it closely, I can see that it is! I would have guessed that was chicken. Sesame seed and salmon, huh, interesting combination for sure! 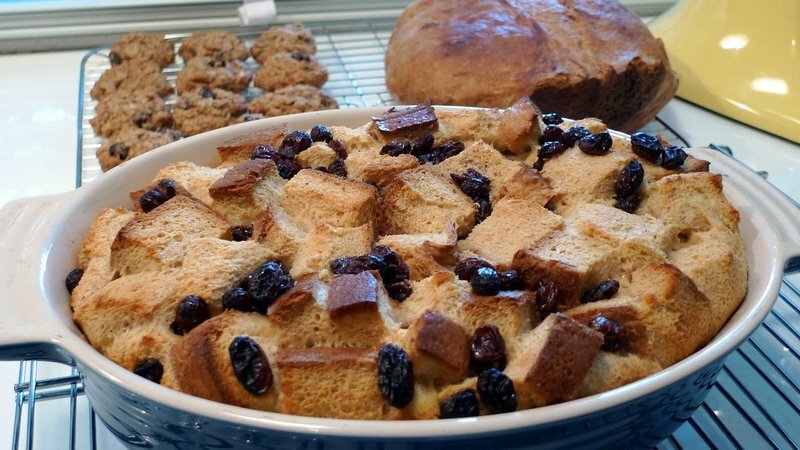 What is your bread pudding recipe? I’m looking for a good one. I bet that bread pudding is to die for. I love a good bread pudding anytime, any season! @karen_lynn – The pie, sadly, did not turn out. Still having problems getting the pudding to set. @ZSA_MD – I thought it was a little dry. Perhaps I should have soaked the bread in the custard for a while before baking it? @TheCheshireGrins – It was very ad hoc, Meg. I just whipped some eggs and milk together, added some sugar, vanilla, and nutmeg, then poured it over the bread and raisins. Something a little more researched might be a better choice. @Southeast_Beauty – Chicken would probably go well with the sesame seed coating, too, although it might be a bit overwhelming. Maybe if the chicken were cut into strips. @ElusiveWords – Yeah, we dressed the noodles with a bottled soba sauce, but you could use seame oil and green onions to good effect. @marc11864 – @ThePrince – @New_Egyptian – @yang1815 – Thanks@iskrak – No, he only pan fried the original, no broiler work. I was his sous chef so saw it up close and personal. @CurryPuffy – Exactly. The egg white helps it adhere and also forms more of a crispy crust with the seeds. Soy sauce adds a bit of flavor. I would recommend salting the fish before cooking, too. I didn’t do that but it could have used a little more seasoning. @foggysunnymorning – My favorite cookie. @kunhuo42 – Third attempt was a massive fail. The only thing that is getting better is my crust. I don’t know what’s going on, Aaron. @christao408 – LOL! Aw, sorry it didn’t turn out! Obviously worse could have happened though! Lol Hope you had a great weekend! ooh.. how come his sesames came out so diff?? @iskrak – I think he used more oil in the pan and higher heat, thus scorching them a bit. I was more gentle in my treatment. LOL@karen_lynn – Yeah, pity the pour soul who has to taste test macadamia nut cream pies, right? @christao408 – oh no! i really want to try this out now and see what’s going on. it’ll have to wait a bit, though, as i’m going out of town for a conference and then visiting my parents for thanksgiving. maybe while i’m back in hawaii i’ll see if i can get some tips or better directions from my sister. As always, your food looks so yummy! I should try the salmon and soba recipe. Please forward if you get the chance. It’ll be a nice weekend meal some time. @kunhuo42 – I need to sit down and compare the three recipes I’ve used and try to figure out what is going on. I’m inclined to think that the recipes must be fine, so either there is a fault with one or more of my ingredients or else my technique. I’m following the recipes very closely, though, so it would seem that technique isn’t likely. But what is the common cause in the ingredients? I thought it might be old cornstarch, which is a dubious and unlikely problem, but I used flour in one recipe so that isn’t a common ingredient. The eggs? They are smaller here than in the US, so maybe that is the problem. Some recipes call for whole eggs but professional chef friends recommend yolks only, so that is what I tried in the third recipe. One thing that is kind of odd is that in the last two recipes, the mixture appeared to be thickening nicely but after refrigeration had not set any further. That seems really odd and makes me wonder if it isn’t chilling quickly enough. The starch could break down at an extended high heat. So many things to think about and, frankly, not a lot of free time these days to play Alton Brown. @swcheng15 – Actually, I don’t have a recipe yet as the friend in HKG hasn’t sent to me. Basically, here’s what I do: cut a salmon fillet into individual sized portions, leaving the skin on. Pat dry, then brush a mixture of egg white and a little soy sauce on the skin side. Dip the skin side in a plate of toasted sesame seeds (I like a mixture of black and white seeds) and then pan fry on all four sides (starting with the skin side) until cooked to your desired doneness. I serve it over soba noodles that are boiled al-dente then drained under cool water. It helps to add some ice cubes to the noodles while they drain to stop their cooking. Let the noodles drain a bit and then you can dress them with soba dipping sauce or, more simply, a little bit of sesame oil, soy sauce, and a sprinkling of green onions.